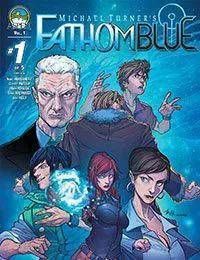 An unlikely team of BLUE rise in this BRAND NEW Fathom series! They have all risen from beneath the surface. Each for a different purpose yet united in their exile from their homelands below. Looking to blend in-out of sight--amongst humans unaware of their true potential. However, one man, who has spent the better part of his life hunting the Blue, is keenly aware of their presence-and he will stop at nothing to use these Blue as weapons against their own, even if it means killing them in the process! The first all new Fathom series to make its debut since Michael Turner introduced you to his incredible underwater adventure over 15 years ago, is ready to take you on the ride of your life and explore the world of Fathom as youve never seen it before!